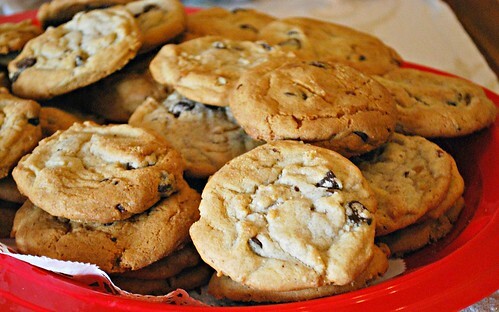 I love chocolate chip cookies, as they are my absolute favorite cookie anytime of the year... including the holidays. Often times I will take a trusty chocolate chip cookie recipe and change it ever so slightly by using a different kind of chocolate chip or throwing some kind of chopped nuts or another ingredient. For the recent cookie swap I hosted, I opted to throw in some caramel bits and chopped pecans into the base recipe for a new favorite version. 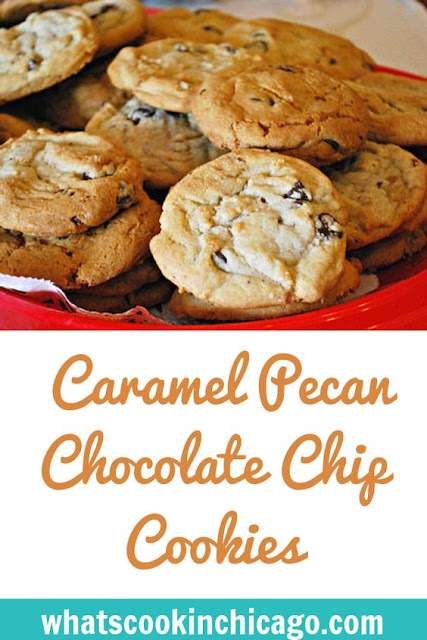 These Caramel Pecan Chocolate Chip Cookies will please those who love the buttery caramel and toasty pecan flavor along with chocolate. It kind of sounds like a turtle candy... but definitely not as decadent. If you like all those flavors, this is a cookie recipe you'll need to try! Tip: if you want to get crazy, stir in 1/4 cup crushed pretzels for a different twist! In a medium bowl, whisk together the flour and baking soda together. In a small cast iron skillet, melt 10 tablespoons of the butter over medium-high heat and allow it to continue cooking until it reaches a dark golden brown and has nutty aroma, roughly about 1 to 3 minutes. Transfer the browned butter to large bowl. Stir in the remaining butter until completely melted. To the melted butter, add both white and brown sugars, salt, and vanilla extract, whisking together to fully combine. Next, add the egg and extra yolk; whisk until you have a smooth mixture with no lumps. You will want to let the mixture stand for about 30 second and then whisk it again for 30 seconds. Repeat process of resting and whisking 2 more times until mixture is thick, smooth, and shiny. This process allows the butter to cool down and firm up slightly with all the other ingredients to really get the flavor throughout. Using rubber spatula or wooden spoon, stir in flour mixture a little at a time just until combined. Take your time so you have a nice consistent batter. Stir in chocolate chips, caramel bits and pecans; and give the batter a final stir to make sure everything is evenly distributed and there are no flour pockets. Drop a tablespoon of dough 2 inches apart on the prepared baking sheets. Bake the cookies one tray at a time for 10-14 minutes. Remove tray from oven and transfer to a wire rack to cool. Serve when slightly warmed.